TN MRB Nurse Syllabus 2019: Have you applied for the TN MRB Nurse Recruitment 2019 and waiting for the TN MRB Exam Syllabus 2019? then, check out the entire page to get the latest mrb.tn.gov.in Nurse Syllabus 2019 subject wise. Candidates are suggested to prepare well for the upcoming Tamil Nadu Medical Recruitment Board (TN MRB) Nurse Examination 2019. Moreover, the officials of the TN MRB have scheduled the examination date for 23rd June 2019. On this page, we have clearly mentioned the subject wise TN MRB Nurse Exam Syllabus in such a way that all the eligible candidates can start preparing for the examination. Further sections of this page give you the detailed information of the TN MRB Nurse Exam Pattern, the தமிழ்நாடு மருத்துவ பணியிட வாரியம் Nurse Selection Process 2019, the preparation tips for the test. The direct link to download the mrb.tn.gov.in Exam Syllabus 2019 PDF to the end of this page. The Selection will be made based on the marks obtained in the தமிழ்நாடு மருத்துவ பணியிட வாரியம் written examination, duly following the rules of reservation and communal rotation of Government of Tamil Nadu. And the TN MRB Nurse Selection Process 2019 is done as below. TN MRB Online Application Form. The Tamil Nadu Medical Recruitment Board (TN MRB) reserves the right to increase or decrease the number of examination centers and to re-allot the candidates (depending on the number of application, administrative exigencies). Candidates need to check the TN MRB Nurse Exam Pattern 2019 from the below table. The question will be in the standard of Diploma level in Nursing. The question paper will be set in English only and will contain 200 objective type questions of 100 Marks. There will be no negative mark for the wrong answer. And also there will be no oral Test (Interview) for the post. Candidates who have applied for the Tamil Nadu Medical Recruitment Board (TN MRB) Recruitment of 2345 Nurse Posts, need to start preparing for the upcoming examination. As the officials mentioned the exact date so all the eligible ones should move on for the development process. And we heard that many of the candidates have not yet started preparing for the test. So, for such candidates, we have clearly mentioned all the particulars regarding the mrb.tn.gov.in Nurse Syllabus 2019. Along with those details, we have also included the preparation tips, the TN MRB Nurse Syllabus 2019 which contains all the subject wise Syllabus topics in PDF format. That too it is available for free. Moreover, you can enhance more and more skills throughout the preparation. Complete the preparation process in time so that you can have the time to revise more and more. Soon after referring to the download link as given below, download it and then start solving the higher weightage concepts. So that you can better complete them in an easy manner. Collect a soft copy of mrb.tn.gov.in Nurse Syllabus 2019 PDF along with the Exam Pattern. 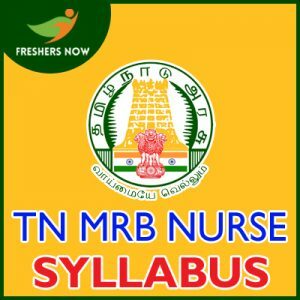 Revise all the concepts of the TN MRB Nurse Syllabus 2019 with the help of study notes as provided on this page. We hereby enclose this page with the latest TN MRB Nurse Syllabus 2019, Exam Date. So, if any of you want to know the more information about the Tamil Nadu Medical Recruitment Board (TN MRB) Recruitment 2019, they can simply drop their comment in the below section of our Freshers Now page.